Life is like a box of chocolates – you never know what you’re gonna get. 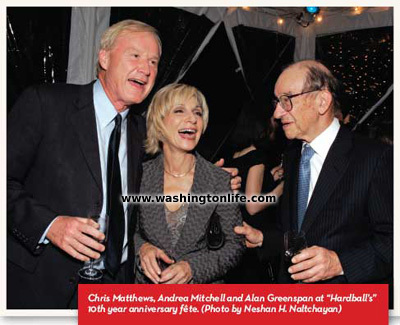 “Hardball” host Chris Matthews found this out the hard way the night before his 10th MSNBC Anniversary party at Decatur House in October. Matthew appeared on The Daily Show withJon Stewart to promote his new book, “Life’s a Campaign.” The testy exchange resulted in Matthews proclaiming, “This is a book review from hell. This is the worst. You are the worst. You are the worst.” The incident showed up as event cocktail buzz, where a quick thinking Matthews was overheard claiming the incident was fun: “It created a moment … a moment.” The star-studded media crowd included Andrea Mitchell, AlanGreenspan, NBC honcho Phil Griffin, and Rep. Ed Markey (on crutches). Congressional members were keeping their presidential preferences close to their vests: Sen. John Kerry demonstrated restraint when commenting on fellow Bostonian Mitt Romney; and Rep. Steny Hoyer said nothing worth reporting: “It’s a Democratic year.” Few braved the predictions fever. “Giuliani and Edwards in a surprise move,” offered Rep. Charlie Gonzalez. “Hillary is not locked in; Obama has a chance if he wins Iowa. Romney for the Republicans,” suggested PatBuchanan. Matthews was wired – no surprises here. Introduced as “Chris is always going to tell me something I don’t know. Tonight we’re waiting for him to tell us something we don’t know.” Whether Spiro Agnew “was not an American hero” is something new, Matthews said it anyway along with some Cheney comments. What’s not new is that he has been successful and continues to be the darling of MSNBC. Applauding his success: Sen. Ted Kennedy, Rep. Patrick Kennedy, Frank Mankiewicz, Margaret Carlson, GloriaBorger and Tim Russert. Sarah Bennet, Sheila Harvey, Michelle Lee (no, not that one), Suzane Malveaux and Faith Shah. Helen Thomas and Sue Merry enjoyed the view. “We are also most fortunate to have such an exemplary group of Washington women come together and rally for such a wonderful cause,” said Kay Enokido, executive vice president/owners representative for the Hay Adams. Here’s looking a you, kids. New York Times bestselling author Michael Korda arrived at Bonnie McElveen-Hunter’s Georgetown manse in September with a former president in tow – in the form of his rather ambitious and weighty 800-page biography Ike: AnAmerican Hero. It’s not only a story of military prowess, but one of family origins and life, “It is as well the portrait of a tumultuous and often difficult marriage, for Mamie was every bit as stubborn and forceful as her husband, and it was by no means the sunny, happy marriage that Republican publicists presented to the public when Ike made his first moves towards the presidency.” The prolific author has written more biographies than a cat has lives (he even wrote Cat People – perhaps to keep the “lives” thing going.) It was a spirited event, and guests included: Susan Eisenhower, Bob Merry, Sheila and EdWeidenfeld, Ann Stock and Nini Ferguson. Look for more fabulous entertaining at this residence; Bonnie Hunter heads up The American Red Cross.